Politicians sign up to TV throw-downs! Will it save British politics? Iiiiin the red coooorner, Goooordon’The Cyclops’ Broooown! And in the blue coooorneeer, David ‘Pillow Face’ Cameron! And in the yellow coooorneeer… that bloke… uh… Nick Clogs or something. Yep. British politics is slowly coming to the realisation that we, the British public, are far more interested in American politics because it’s more fun to watch. The Obama/McCain throwdown was one of the most captivating and brilliantly crass TV series ever. The way Joe The Plumber was dragged into it… then dragged over hot coals… the squaring off, the high production values… it had everything. British politics meanwhile, is still kissing babies and evading the answers. Of course, there is something wonderful about the House of Commons and the panto bickering of Prime Minister’s Question Time… but it doesn’t feel like a TV show does it? It’s peering into a fusty old world and often wondering what the hell people are talking about half the time. These debates will, for the first time, see our politicians arguing with each other knowing damn well that they’ll have to speak in a language WE understand or lose. And so, our MPs agreeing to live, televised debate shows is rather exciting for anyone who gives a fig about the way our country works. In addition, we can cross our fingers for someone getting verbally slapped to the point of tears on telly. It’ll be the thinking man’s equivalent of waiting for a crash in F1. Next year’s general election campaign will be fought over in public, eye-to-eye and shown on three channels. It has been agreed that three programmes will be broadcast in peak time in front of studio audiences… a bit like Question Time. Each will be between 85 and 90 minutes long. ITV is to stage the first debate, which will be presented by Alastair Stewart. Sky will produce the second debate presented by Adam Boulton, and David Dimbleby will present the final programme on the BBC. We’re not sure whether the questions will come from presenters or members of the public in the audience… I’m hoping it’s the latter. British TV to adopt the American presidential debate system! BBC, ITV and Sky have today written to the leaders of the Labour, Conservative and Liberal Democrat parties with a joint proposal for three live televised debates during the next general election campaign. The individual broadcasters would be responsible for producing and broadcasting one debate each between all three party leaders. Each of the three debates would be transmitted live by the originating broadcaster in peak time and made available to all other British broadcasters subsequently. The broadcasters have formed a joint team to discuss detailed plans with the political parties. Each of the broadcasters will seek to make suitable arrangements for ensuring due impartiality across the UK. 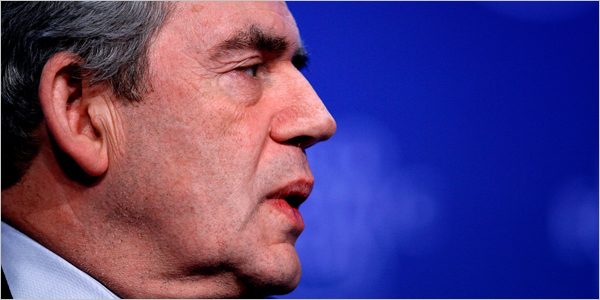 Prime minister Gordon Brown has said he is game for these televised debates ahead of the general election. In a letter on the Labour party website Gordon Brown said he believed it was “important for the country” for party leaders to take part in a wide-ranging series of broadcast debates. Tory chief David Cameron and the Liberal Democrat leader, Nick Clegg are also up for taking part in this live debate show(s). Personally, I’m really excited about this. The American system of presidential debates is brilliantly crass (just look at all that Joe The Plumber business in the Obama/McCain face-off) and wonderfully entertaining. The American way of doing things captures the attention of apathetic British people in a way we haven’t seen over here since the Labour Party was elected in the ’90s. British politicians are increasingly becoming removed from the real world and this could be an excellent way of engaging people in politics again. Personally, I’m just looking forward to the gladiatorial aspect of it all… watching one politician lay the smack down on another and the tense beads of sweat on the face of the loser… fantastic!